The CoffeeShop Blog: CoffeeShop "Watercolor Valentine" Digital Paper Pack! 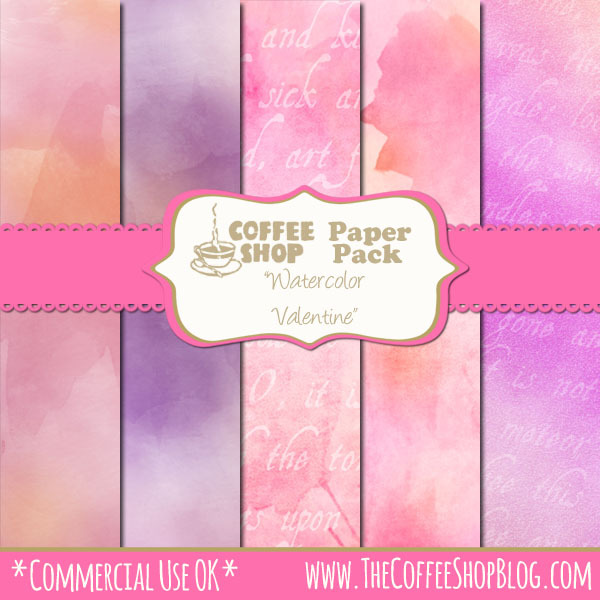 CoffeeShop "Watercolor Valentine" Digital Paper Pack! I found some beautiful free watercolor digital paper and I played around with them in Photoshop to create this new set of high resolution digital watercolor papers perfect for Valentine designs. These would be lovely on Facebook covers, blog/website backgrounds, greeting cards, business cards, storyboards, etc. I am working on some new actions for next week, so stay tuned! And today is actually sunny so this afternoon after school we are going to head out to the park and enjoy being well and get some Vit. D.
You can download the CoffeeShop "Watercolor Valentine" Digital Paper set. You can also download it here. I'm a big fan of watercolour backgrounds so thanks for these!